Σωκράτους δὲ περὶ μὲν τὰ ἠθικὰ πραγματευομένου περὶ δὲ τῆς ὅλης φύσεως οὐθέν, ἐν μέντοι τούτοις τὸ καθόλου ζητοῦντος καὶ περὶ ὁρισμῶν ἐπιστήσαντος πρώτου τὴν διάνοιαν, ἐκεῖνον ἀποδεξάμενος διὰ τὸ τοιοῦτον ὑπέλαβεν ὡς περὶ ἑτέρων τοῦτο γιγνόμενον καὶ οὐ τῶν αἰσθητῶν: ἀδύνατον γὰρ εἶναι τὸν κοινὸν ὅρον τῶν αἰσθητῶν τινός, ἀεί γε μεταβαλλόντων. οὗτος οὖν τὰ μὲν τοιαῦτα τῶν ὄντων ἰδέας προσηγόρευσε, τὰ δ᾽ αἰσθητὰ παρὰ ταῦτα καὶ κατὰ ταῦτα λέγεσθαι πάντα: κατὰ μέθεξιν γὰρ εἶναι τὰ πολλὰ ὁμώνυμα τοῖς εἴδεσιν. Now, when Socrates occupied himself with ethics, giving no heed to Physis while seeking for what was universal therein and being the first to consider definitions, he [Plato] not only supported that approach but also favoured other existents rather than that consideration of percipient things, since [for him] it is not possible to have a standard for percipient things since they undoubtedly are liable to change. These other existents he termed Forms, saying that each and every perceptible thing – being related to them – was so described because of them. For the generality, similarly named, have their being by participating in those Ideals. physis. φύσις. The usual translation here is ‘Nature’ as if ‘the natural world’ – and the physical cosmos beyond – are meant. According to my understanding of Aristotle, that is wrong. For, given that in Book 5, 1014b-1015a [φύσις λέγεται ἕνα μὲν τρόπον ἡ τῶν φυομένων γένεσις οἷον εἴ τις ἐπεκτείνας λέγοι τὸ υ ἕνα δὲ ἐξ οὗ φύεται πρώτου τὸ φυόμενον ἐνυπάρχοντος…] Aristotle describes in some detail the various meanings of physis, it is logical to assume that he is here probably using the term ontologically as described there. Hence a transliteration is preferable. 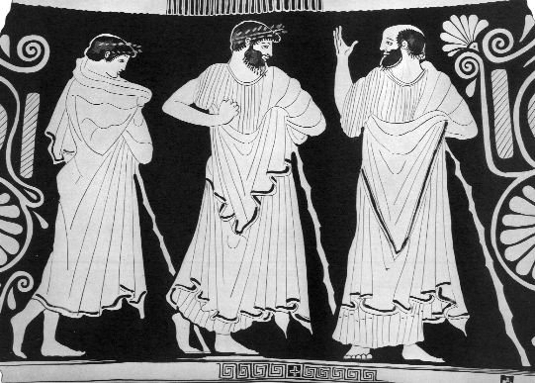 Thus, my understanding is that Aristotle is here critical of Socrates and Plato because – in their pursuit of abstractive definitions – they neglected physis: that is, neglected being and the potentiality of being to ‘change’ as in and for example (a) the motion (of ‘things’) and (b) the ‘natural unfolding’ or growth that living beings demonstrate. The distinction – between percipient (a person who perceives) and sensible (perceptible by the senses) – may be subtle, but in my view is important for one relates to a person while the other relates to ‘types of being’ perceived. Hence why Aristotle goes on to mention the reason for Plato conjecturing his ‘theory of forms’ – because, according to Plato, individual percipients have changing and variable perceiverations of ‘sensible things’. undoubtedly liable to change. ἀεί γε μεταβαλλόντων. For ἀεί as the more subtle ‘liable to’, ‘subject to’ (change) – rather than the bland ‘always’ – qv. Heraclitus Fragment 1 and Herodotus Book 2, 98. Forms. ἰδέα. Since Plato often used ἰδέα and εἶδος interchangeably, ‘idea’/’ideals’ is also a suitable translation here, whence εἶδος as used by Aristotle would be ‘form’ rather than an ‘ideal’. For the generality, similarly named, have their being by participating in those Ideals. κατὰ μέθεξιν γὰρ εἶναι τὰ πολλὰ ὁμώνυμα τοῖς εἴδεσιν. A rather obscure passage, which Aristotle goes on to explain is because Plato himself was rather vague in respect of what he meant by ‘participation’ (μέθεξις).